Dr. Stephen Russell is pioneering oncolytic virotherapy as a new modality for the treatment of cancer using state-of-the-art facilities at the Mayo Clinic in Rochester, including the preclinical U-SPECT/CT imaging system from MILabs. 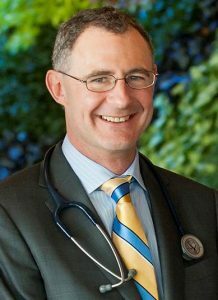 Dr. Russell was recruited to the Mayo Clinic from the University of Cambridge, UK, in 1998 to be the Director of a new virus and gene therapy program at Mayo. Under his direction, the program has become a very strong hub of Oncolytic Virotherapy Research  at Mayo Clinic. In collaboration with Imanis Life Sciences , his cutting-edge techniques for manipulating viruses are paving the way for companies such as Vyriad  to create a new generation of tumor-fighting drugs. What is the premise of your oncolytic virotherapy research program? The premise is to engineer viruses so they can selectively infect and destroy tumors without harming healthy tissues. We have developed a large number of different targeting technologies allowing us to redirect different viruses to only attack cancer cells. It’s an interesting kind of tumor killing approach because in the first stage the virus spreads and can directly kill tumor cells. But then there’s the second phase: after the virus infection has been eliminated, the immune system better recognizes the cancer antigens and then the immune system can now start killing the infected tumor cells. It is an appealing approach that dovetails really well with all the advances going on in immuno-oncology. 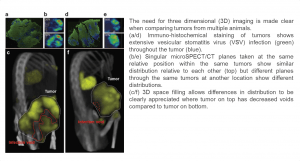 Why is imaging so essential for the oncolytic virotherapy research? The critical questions with oncolytic virotherapy are; where do the viruses go, how long do they persist and how fast do they propagate after they’ve been administered to patients? Therefore, we need in vivo imaging to allow us to track the fate of the virus. We have engineered our viruses to encode the sodium/iodide symporter (NIS) which is long been used for thyroid imaging. There are a number of clinically approved radiotracers that can be used for NIS imaging but also, there’s a great deal of research going on in radiotracer development. We can use both SPECT and PET imaging radiotracers. The U-SPECT/CT technology has been a crucial component of our entire program. The instrumentation has given us the capability to do our preclinical imaging studies with very high resolution in small animals and visualize and quantitate where the virus is going and how long it lasts in the body. What were the specific challenges of imaging viral gene expression? The first main challenge was finding an answer to the key question: does the virus selectively transduce tumors after it has been administered intravenously? We would grow subcutaneous or orthotopic xenograft tumors in mice, administer our oncolytic virus intravenously, and then image at different time points to see when, where, and to what extent do tumors light up. At the same time, we’re interested to know the relative uptake of radioiodine by the tumor versus the normal uptake by normal thyroid tissue. The U-SPECT/CT was very helpful to confirm that the systemically administered virus was transducing the tumor specifically, and was not giving a signal in other tissues, plus we could determine the relative intensity of the signal in the tumor versus in the thyroid. The high-energy sub-mm imaging resolution of U-SPECT/CT was also essential to us because we can chase the virus with radioiodine I-131 in order to boost the efficacy of the virus therapy. When we see a strong uptake of radiotracer in the tumor, we also have to be able to deduce from the images that we are not going to damage normal thyroid function in the process. When this research became routine with the system, we started to get interested in other questions requiring even higher resolution images. How did the U-SPECT/CT technology enable you to expand the scope of your research? One of the key questions is whether there is a mathematical model that describes how an intravenously administered virus gets into the tumor and then destroys the tumor? And to what extent does the virus actually propagate and destroy tumors? Moreover, how does this relate to the intravenous doses administered? With the very high resolution of the U-SPECT/CT, we could look at these subcutaneous tumors in mice and see individual foci of virus infection within the tumor. It wasn’t just asking, is the tumor positive? It was asking, how many positive foci are there in the tumor? How are they distributed? Is the distribution uniform or random? Is it obeying some mathematical laws or is it random because of vascular supply? Using serial imaging, we could see that the virus infections set up individual foci that expanded and ultimately coalesced to destroy the entire tumor. This was very different from the mechanism of viral spread within the tumor that we had expected. We thought the virus would come back out to the bloodstream and re-infect, and there would be loads of new foci appearing, but no. What happened was that initial intravenous dose set up individual foci that expanded centrifugally and coalesced. We could see all that from the high-resolution imaging . We were also able to confirm our in vivo findings by looking at tumor biopsy samples taken at varying time points, post administration of virus, and the correlation has been superb. We call it ‘radio-histology’ because with such high-resolution imaging you can really use it instead of the laborious histological analysis of tumors, which takes forever. Think about how long it would take to explant a tumor, slice it up into sections, stain everyone for virally infected cells, analyze them with a microscope and then try and rebuild all those images into a three-dimensional picture of the tumor. With just one image from the U-SPECT/CT system, we got this perfect snapshot that tells you what’s going on. Furthermore, you can have it day after day after day, in the same living animal – so it’s also longitudinal. How will oncolytic virotherapy impact the treatment of cancer? From my perspective, it’s not whether – it’s when. We have a number of pre-clinical animal models where you can give a single intravenous dose of virus and the tumors are completely destroyed and don’t recur. We are in the early stages and there is a huge amount more to deliver. The first thing we are hoping to see is that oncolytic viruses will become a component of the therapeutic regiment of cancer patients. As it further develops I think we are going to see a lot of people who receive oncolytic virotherapy for specific cancer indications, and that’s going to be the solution to many cancers . I am quite sure that’s where this is headed and we are obviously at the very early stages of that. Right now oncolytic virotherapy is a critical component of the immuno-oncology therapy “tidal wave” that we see now. Immuno-Oncology treatments comprise checkpoint antibody therapy to unlock the tumor, and then adaptive t-cells that attack the tumor. Oncolytic Virotherapy will be the third component that turns ‘cold’ tumors ‘hot’ and attracts the immune system to powerfully destroy the tumors . 1. Russell SJ, et al. Oncolytic Virotherapy. Nature Biotechnology. Vol 30, 658–670, 2012. 4. Miest TS, et al. Measles Virus Entry Through the Signaling Lymphocyte Activation Molecule Governs Efficacy of Mantle Cell Lymphoma Radiovirotherapy. Molecular Therapy. Vol 21(11): 2019-2031, June 2013. 5. Miller A, et al. Reporter gene imaging identifies intratumoral infection voids as a critical barrier to systemic oncolytic virus efficacy. Molecular Therapy – Oncolytics. Vol 1, 14005. Dec 2014. 6. Russel SJ and Peng KW. Oncolytic Virotherapy: A Contest between Apples and Oranges. Molecular Therapy. Vol 25(5): 1107–1116, May 2017. 7. Russell SJ and Barber GN. Oncolytic Viruses as Antigen-Agnostic Cancer Vaccines. Cancer Cell. Vol 33 (4): 599–605, April 2018.